Since early last year I’ve been most excited about the prospect of a service to bring me the perfect “social content reader”. I wrote about what I’d like to see in such a reader, but in a nutshell it would provide me with content daily based on all the items shared by the users I follow on multiple services like Twitter, Facebook, Flickr, Youtube, etc. Now you may say that we already have web services or apps that do this but they’re all pretty basic without enough logic to determine better ways for how to display the content. For instance Flipboard is one of my favorite apps on the iPad. 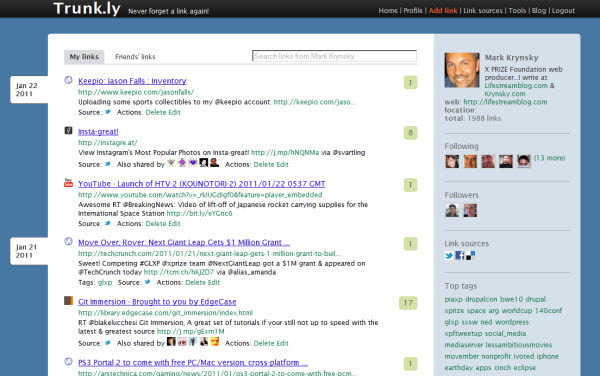 Its ability to provide deep integration with Facebook, Twitter and Google Reader is nice. So for instance I have the ability to isolate the importing of specific Facebook pages, or Twitter lists, or Google Reader folders, but when I go to read these, Flipboard always shows me the most recent items from the last time it refreshed. I would like to see logic in place so that Flipboard could determine how to prioritize the content to show me. I will often read Flipboard in bed at the same time every night. In the new frenetic online world where we are trying to optimize our time and reduce noise, only offering to show me the most recent content isn’t good enough. So what are some of the ways we can improve this? Well I’m already filtering the content I want to see based on only displaying items from the people I follow with regards to Facebook and Twitter shared links. But to make sure that I’m also viewing the best items daily from this subset of data we need to sort it using a method other than recency. So for Twitter I’d like it to show me the links shared by those I follow sorted from most to least just like I get in Tweeted Times. For Google Reader I’d like to see items sorted by the most shares/likes from the people I follow. Facebook could sort by mutual shares or quantity of likes and comments. In any case these methods would provide a better way to provide a “best of day” as opposed to just the most recent updates. Lastly, besides logic behind the sorting I’d also like to see content types displayed in separate sections. So you could have photos, videos, and even music within dedicated sections of this reader. So why isn’t there a service or app that does this yet? I have no idea but I’m starting so see some glimpses of hope that such a reader will emerge. Last week I started playing with two new entrants that show signs of trying to tackle improving the social content reader. Trunk.ly is a service that aims to passively collect all of your shared links across several services. Currently they support Twitter, Facebook, Delicious, Pinboard, and RSS feeds. After you’ve linked up your sources you will now get a page that displays all of the links you’ve shared on each of the respective services. So in the case of Twitter and Facebook all of our status update ramblings without links are omitted. Then as you follow other users on the service you get a page of all the most recent links they’ve shared. So far so good, but the feature that then struck me as cool is that alongside page that displays friends share links there is a counter that shows how many other users on the service also shared that link. The problem is that you can’t sort by this data or have access to a best of day based on it. Clicking on the share counter and seeing other users who shared the same link also acts as a great discovery tool to find other good link curators. One limitation of using a separate service such as Trunk.ly though is that I need all the people whose links I want see to use this service. If they offer a way to import the links of those you follow it would be great but I’m not sure that’s withing the scope of their roadmap. However, with RSS support you could get tricky and build some aggregated feeds and import them as an option. You can read some more about Trunk.ly at ReadWriteWeb and GigaOM. 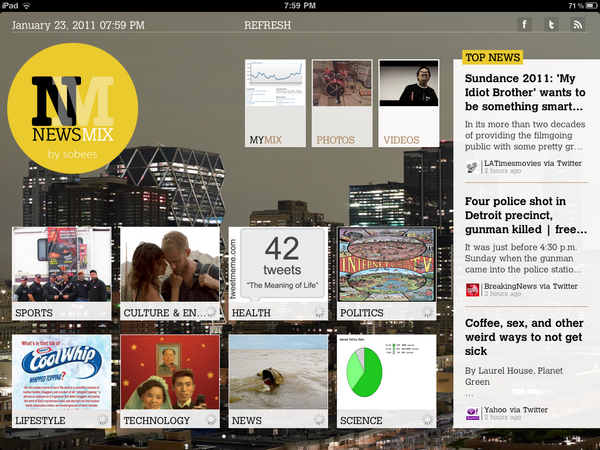 Newsmix was another app announcement last week that got me excited. Billed as a similar app to Flipboard, it was some of the differences I focused on. You can import your Twitter, Facebook, and Google Reader data although not as granularly as Flipboard. The user interface is very nice and similar to Flipboard, but it has some distinctions which include features I’ve been looking for in social content readers. Unlike Flipboard, the imported data doesn’t reside in a section defined by the source. They instead create sections based on the content type. So there’s a sports, technology, news, and several other content types. I’m not sure what logic they use to categorize the data and there are definitely missteps here, but it’s an interesting change with regards to organizing content. They also provide separate dedicated sections for photos and videos. They do a nice job here filtering links and shared photos to be displayed in this section. They also have a top news section which I’m not sure how it’s determined and only supports 3 items at the moment, but could be a useful section. You can read more about Newsmix at TechCrunch and ReadWriteWeb. So while the concepts I’ve described for what I’d like to see in a future social content reader aren’t yet met by these two services, signs of these new features starting to appear is a step in the right direction. There are also many other services and apps, each using their own logic and display methods in the social content reader space including the already mentioned Tweeted Times, Paper.li, Cadmus and mobile/tablet apps Flipboard, Pulse, My6Sense and Cascaad. If you want to learn more about how relevance has become the holy grail of filtering our content go read this post by Mahendra Palsule. I’ll continue to monitor developments in this area and share what I find here. Thanks for the Trunk.ly review. Some of the features like sorting, better filtering and so forth to help manage the the timeline are definitely on the roadmap, as well as some of the “best link” type features – finding and recommending the links you might like based on those that are popular across your social graph. Because of restrictions with accessing different profiles etc. it’s not on the roadmap at the moment to allow you to follow non-trunk.ly users. Depending on the source as you’ve pointed out, you could use the RSS connector to achieve that. I knew someone somewhere wanted to find the same holy grail i’ve been looking for. Your wishes are plain old “common sense” requirements: they are GOLD for anyone thinking about developping such a tool. Common sense, or “out of the box” reflexion on “who needs what”. As you mention, reading news in bed is a fundamental use case. Does someone going to bed really want to see the latest contributions? Not necessarily, of course. What about someone waking up? The same: they’re not looking to hook up with the stream. They just want the best of the news. Not the latest, and not necessarily the most popular (more tricky to handle that one). Maybe just the “Best of “, whatever that means. Best of the conversation, since the last time I checked for instance; Friendfeed has this “best of N days” functionnality. One more reason why this service seduced me, at the time. Will keep an eye/ear on what you’ll find Mark! Thanks for the comment Tim. Any chance of providing the ability to bring in links from my complete Twitter stream instead of just my own? I really like the service and will continue using it and watching it progress. Good luck. Zackatoustra yes it seems we both share the same thoughts on what type of reader we’d like to see. FriendFeed’s “Best of Day” is a good example that provides the items that were most liked / commented on. For my account though it primarily displays status updates which are nice…but I’d like to isolate this by external links. I’ll keep looking for new services and apps and cover them here. Thanks for reading. My name is Dave and I would also like to bring your attention to Trunkler – an iOS client I built for Trunk.ly. It’s super easy to use. Now you can get all the goodness of Trunk.ly directly from your iPhone or iPod Touch.